Headquartered in Rubiera (RE), Italy, SIMET earned its position as one of the global market leader in the field of Winding / Doubling. SIMET is exporting in all 5 continents and has agents all over the world. Founded in 1967, today the company is still actively controlled, managed and directed by the same families. The company always concentrated on export and internationalization of its activities, establishing rapidly good customer’s relationships all over the world. The company’s success globally was largely due to its committed focus on the quality, the reliability and the endurance of the final products, reflecting the best practices of the textile industry. Research, specialization, comprehension of the requests of the final users and collaboration with the customers are the core of SIMET’s philosophy. These are the pillars of the growth of SIMET. SIMET supplies the world's leading manufacturers of textile, specialized in natural fibers. 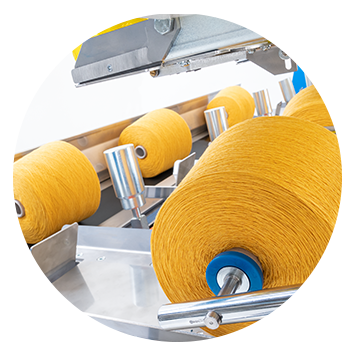 It also ranks at the highest level in the global market as a significant supplier of interlacing / intermingling winders for seamless and hosiery industry. The company relies on advanced R&D department, as well as on test department to try the yarns in their real applications. The great flexibility and reliability achieved in the manufacturing processes allow full product (components and systems) customization for personalized requests on the part of the client. SIMET makes continuous efforts to reach excellence and guarantee product reliability. SIMET is associated to ACIMIT (National Association of the Textile machinery Manufacturers).